An evening of murder,mystery, food and fun! The Museum hosted a table to present its slate of summer programs at the city-wide Expo of the Senses. The Museum held 2 financial advice seminars in May that were hosted by Ameriprise Financial and led by financial advice experts. On June 26th, 27th and 28th, the Museum hosted a seiries of challenging and informative math and science events. 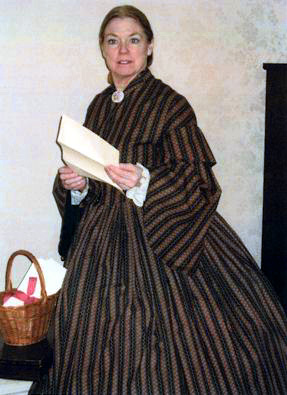 Historical Actress Lynne McKenny Lydick portrayed Clara Barton in "Follow the Cannons: A Reading of Clara Barton's Civil War Letters." An interactive event designed for children in grades 3 through 5. Murder and Mystery at the Museum! Ever wondered what it would be like to step into the shoes of Agatha Christie? Over 80 local "sleuths" put their crime solving skills to the test on October 17th at WAW’s first Murder Mystery Dinner. This interactive “Whodunit?” got dinner guests out of their seats and into the fun while raising funds for the Museum. Museum treasurer, Kelly Fox said "We thought that it would be fun to do something a little different, and we've had really wonderful feedback and ticket sales." During a delicious catered dinner, the mystery unfolded as the guests put on their best Sherlock Holmes impersonations, helping our detective solve the evening's mystery. The best detectives won great prizes, but everyone had an opportunity to take part in our raffles. This inventive and entertaining story was written by our own summer intern and North Attleboro resident, Anu Khan, who is in her sophomore year at Princeton University. The cast included local volunteers and board members, who portrayed various characters as the story played out. There were lots of laughs, courtesy of local radio personality and comedian, Dave Kane who played the lead detective role to perfection. All in all it was a deliciously satisfying serving of murder, mystery, food and fun! At the Women at Work Museum, we always strive to be involved in the Greater Attleboro community. 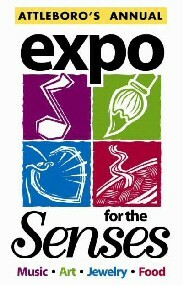 This summer, we took part in the exciting 1st annual Expo for the Senses. At the Expo, our volunteers helped kids make simple but colorful spun-yarn bracelets to take home. 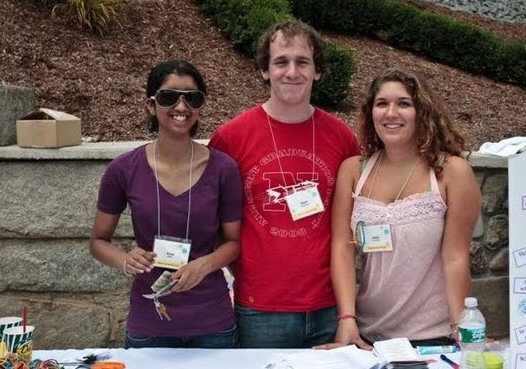 College students Anu Khan (Princeton), Nick DiCola (NYU) and Jess Mazzone (Northeastern) man the WAW table at the Expo, making bracelets and quizzing visitors for our raffle. The bracelets were a hit and lots of kids (and grown-ups!) came back to make second and even third bracelets for themselves and for friends. We also ran a “Do You Know Your Women’s History?” raffle to win a Chamilia bracelet, generously donated by the Attleboro Jewelry Makers Outlet.Our stand was located on the common in Gilbert Perry Square.There were also special activities at the Museum, too! We’d like to thank Attleboro Mayor Kevin Dumas for his vision and Expo Committee members Dianne Thurber, Mim Fawcett, Raymond Norman, Jim Jones, Josh Perry and Nancy Young for making this event possible! Visitors got to design their own race track, and car on both the computer, and using replica figurines. Figured out what worked the best and learned about women like Debra Renschaw that race professionally. In this exclusive challenge only at the Women at Work Museum, selective teams were formed where the players completed a series of challenges that required the participants to have fun while learning. Why doesn’t the Brooklyn Bridge fall down? What keeps all those skyscrapers standing despite all that wind and rain? These answers were learned on June 30th when the participants were given the chance to learn how a skyscraper was designed by architects like Emily Roebling who designed the Brooklyn Bridge. Then they made their own (much smaller version) and put it to the test! A diamond is beautiful, but why? Learn about jewelry, and what makes it so beautiful, and who designs them. While learning about jewelry participants were given the opportunity to design and create their own piece of beautiful jewelry and take it home to show off. The Brennan Family having fun! Math Games at the Museum offered a variety of fun games for children to explore concepts such as probability, codes and puzzles. This was an interactive event designed for children in grades 3 through 5. The cost was $5 per family. View the Photo Slideshow of this event. Our annual auction & reception was held on June 6th. We had a great turnout and several fabulous items were auctioned off throughout the evening in both our live and silent auction! Auction items included paintings & artwork created by local artists, Boston Harbor sailings, sports memorabilia, passes to area museums & attractions, gift baskets, gift certificates to local retailers & restaurants, and many other wonderful items. Light food and beverages were served. Funds raised support museum programs & exhibits. Click here to see a sample of the wonderful items we had available for this year's auction! Click here to view the 2009 Auction Photo Slideshow! The Women at Work Museum hosted two Financial Advice Webcasts, on Wednesday, May 13th and on Saturday May 16th. Each session ran for an hour and fifteen minutes. Ameriprise Chief Executive Officer James Cracchiolo introduced the program, then award-winning author, journalist and contributing editor for "More Magazine" Jean Chatzky lead the program, discussing her viewpoint as to why some people seem to be more successful than others in saving and investing, and listing some things everyone can do to gain more control over their finances. At the conclusion of the program, Ameriprise Chief Investment Officer Ted Truscott and Chatzky answered pre-submitted questions from clients around the country. Executive Vice President of Equities and Fixed Income for RiverSource Investments, Michelle Keeley, was also on hand to help explore strategies for getting back on track in a changing economy. Local Actress, Lynne McKenney Lydick returned to the Women at Work Museum and brought history to life during the annual Clara Barton Tea. This time, Ms. Lydick portrayed Clara Barton in "Follow the Cannons: A Reading of Clara Barton's Civil War Letters." "In my feeble estimation, Gen. McLellan, with all his laurals, sinks into insignificance beside the true heroine of the age, the angel of the battlefield." Tea and refreshments were served. This program was supported in part by a grant from the Attleboro Cultural Council, a local agency which is supported by the Massachusetts Cultural Council, a state agency. Click here to view the Clara Barton Tea Photo Slideshow!